This is a basic technique that I’ve used with collard greens, kale, mustard greens, spinach, dandelion greens, chard, radish greens, turnip greens, broccoli rabe, beet greens, snow pea leaves and arugula. You should riff on it as you see fit based on your tastes and whatever ingredients you have on hand. Heat some fat in a pan. You don’t need much–a tablespoon or so for a whole mess of greens. You can use olive oil, vegetable oil or something from the pork family, preferably smoked. For the greens picture above, I used an ounce of very lean slab bacon, which I rendered with a couple of teaspoons of olive oil. Add aromatics. Now you want to flavor your oil with whatever aromatics you have on hand–onions, garlic, ginger, shallots, etc. I am partial to red onion and thinly sliced garlic. Here I used some garlic scapes. I also like to add a little hot dried pepper at this stage. Add greens. Make sure to rinse them well, as they tend to be gritty. But don’t bother to dry them; the water left on the leaves will help to steam them in the pan. You may want to slice them. If the stems are particularly tough, remove them or add them to the pan first so that they get a head start on cooking. Greens need more or less time to cook depending on their type, the time of year, how mature they are, how cooked you want them, etc. I am partial to greens that still require some serious chewing. 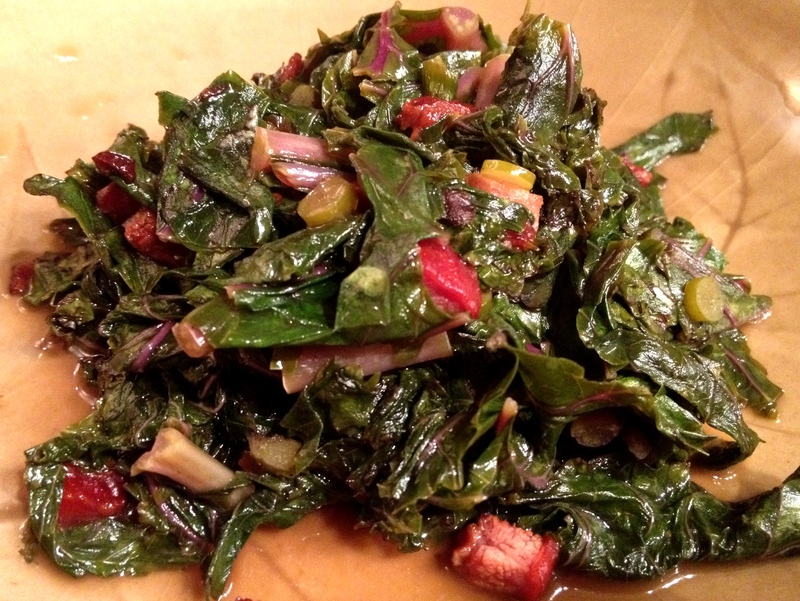 Traditional Southern greens are cooked until they are silky and falling apart. If you want them more cooked, you can always add more liquid (water or chicken broth are nice) and even lid the pan. Finish with salt, pepper and a little acid. Lemon juice, tomatoes, apple cider vinegar and red wine vinegar all add a nice counterpoint to the lush mouthfeel of cooked greens. For the kale above, I used white wine vinegar and regular apple cider, which added a little sweetness to what were some very bitter greens. (A pinch of sugar would also do the trick.) You can also add some more heat and complexity at this point by deploying some hot sauce. You can cook for a bit longer to reduce the liquid if you like, but don’t cook it all away. Pot liquor is delicious! Make it a meal. Sometimes the greens alone are enough for dinner, particularly if I’ve used andouille or turkey sausage back in Step 1. Sometimes I add a fried egg. Sometimes I serve these up in corn tortillas with feta, salsa and avocado. Sometimes I use the greens as a sauce for whole wheat pasta. I ate this purple kale with some ricotta and a slightly sweet, buttery Vouvray. This entry was posted in quick lunch and tagged greens, pork by Jasmine Nielsen. Bookmark the permalink. I eat this for breakfast every morning (dandelions, kale, chard, spinach, lamb’s ear) after gathering the greens and the eggs from my yard. I like the bitter taste but will have to try adding a little acid at the end to see if I like that better.